I admit when I first heard about a Flyathlon is was perplexed, even confused. What was it? When I asked friends I was met with blank stares, the dictionary on my shelf shed no light, I felt like I was ten-years-old again looking for Waldo in one of those maddening books. Then I turned to my Google browser and the first entry it returned caught my eye—Flyathlon: run. fish. beer. Intrigued I dove in, what I found might earn the title of the best Rocky Mountain sport ever. A competitor looking to hook a Rainbow Trout. As Andrew kept running across the mountains an idea started forming in his brain, he would bring friends along to introduce them to his off-the-wall workout plan. What better way to motivate them than with beer? Andrew had always rewarded himself with a cold one after one of his trail run-fish workouts, now he would incorporate it into his new event. The first semi-official Rocky Mountain Flyathlon took place last August at Monarch Lake in Grand County. It was done in a bit of a guerilla style, authorities were not notified, nor the press. After a night drinking beers around a fire, fifteen participants strapped their gear onto their bodies, ran around the entire lake, while pausing to attempt to catch a fish, before finishing their race back at the campsite. The top men and women winners were awarded special 22-oz beers and all participants earned the unique moniker of flyathletes. Once the event was completed Andrew decided he had something atypical on his hands and decided to grow it. He secured the rights to the Flyathlon name, launched a website, looked for sponsors, and created a set of rules (must drink good Colorado beer is a prominent one). His main goal for his fledgling race series is noble “ I would like to see us expand to numerous Front Range cities and pair with local Trout Unlimited chapters, with the goal of introducing more people to the joys of fly fishing. I believe the more people we can get into the wilderness, then the more they will realize how fragile our ecosystems are, and how much help they need. Plus it’s a lot of fun!” Andrew says. This year’s official (yes they have applied for permits and notified proper officials) takes place August 16th near the town of Saguache with an expanded field of 40 returning and rookie flyathletes. The premise is simple, arrive the Friday night to carbo-load with fine beer, wake up the next morning for an 8 am race start, another night of revelry with numerous big fish stories abounding, and head home Sunday afternoon to your normal life with good memories and a new moniker. The proceeds from the event will be donated to Colorado Trout Unlimited. Unfortunately this event is sold out, but Andrew is busily planning more for next season. To learn more visit their website at Flyathlon where past courses Andrew has run are listed and the official rules are located. The official logo of Flyathlon. 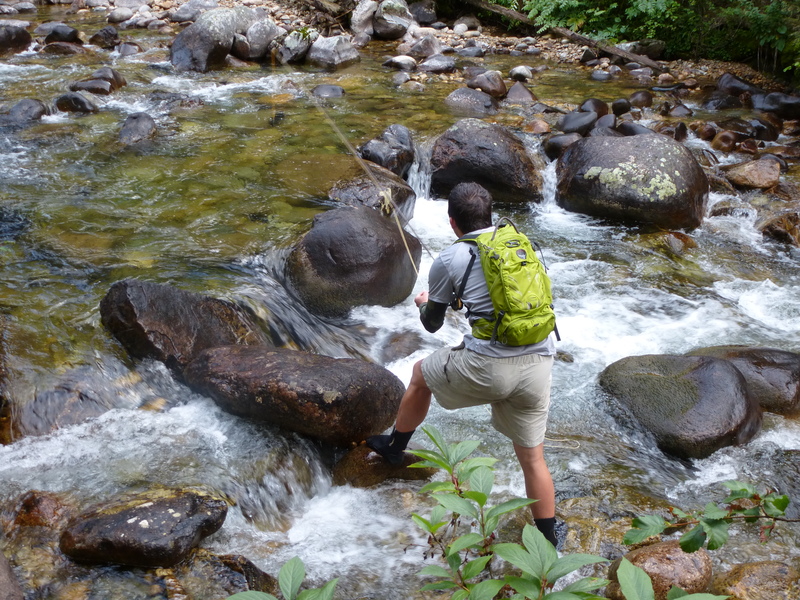 Great way to celebrate life with friends, fish, nature, Colorado…supporting exercise, trout & local economy! 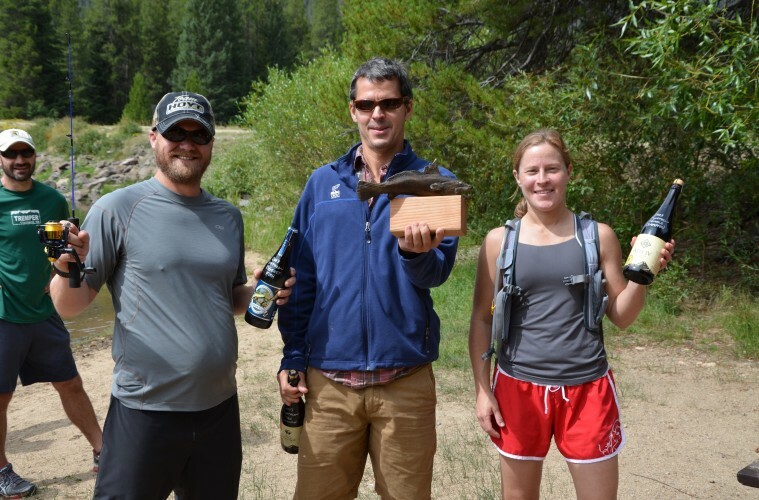 August 3, 2014 Dave P.
Innovative and awesome concept to incorporate three things people love about Colorado – amazing trails, great fishing, and world class beer!